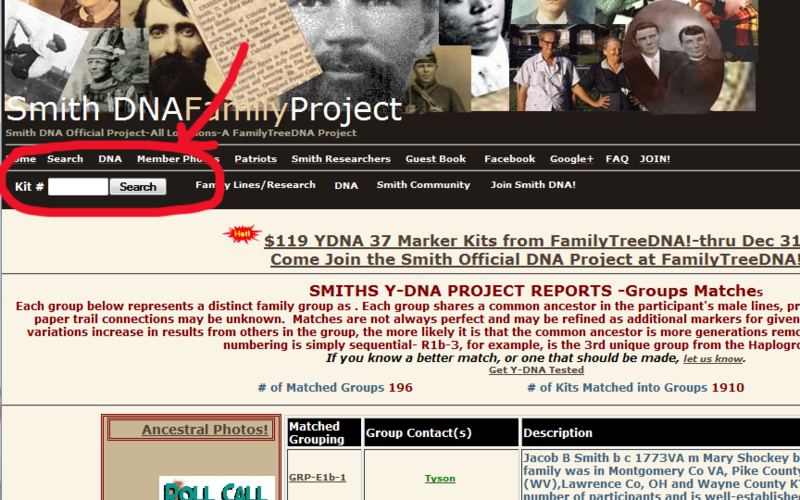 The Smith DNA project includes additional reporting and data behind strictly markers, including, for example, matched groupings when that is the case. With so many members, it’s simply not only not possible to put everything on one page but also not desirable since that page would scroll forever. Instead, because there is so much information, we have provided forms to look up kits, hyperlinks, and search utilities. So think of the DNA Kit # as your key to finding all information about your DNA and your line.IF YOU HAVE A SMITH DNA KIT, the first thing to do to find your information is to look on just about every page directly below the green menu for the form that says KIT # with a Search button directly to its right. Type in your kit number and press SEARCH. 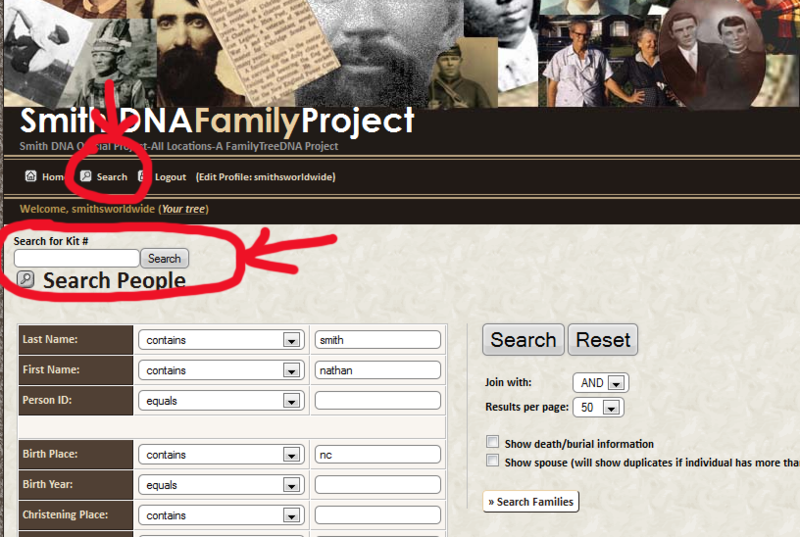 OR find the Search Kit # form on the front page on the right hand side. Searching for your kit number will take you to a page that is a great jumpoff point to find out additional information.That will take you to what I call an index page that is a starter page for everything about your kit. Depending on whether you are a YDNA tester, mtDNA tester, or autosomal/Family Finder, you will see a page for you. If YDNA, you will see your haplogroup, the matched grouping you are in (IF you have matched at least one kit at some level more than 12 markers) then an envelope for being contacted (Contact This Kit) , a tree that leads to your family information, a pedigree icon IF here is one. In the right hand column you will see your haplogroup, Terminal SNP (if listed), and your markers. Underneath that, to compare your markers with others in the same haplogroup, you will see a Compare Markers link and IF you match in a group, a couple of group link reports. 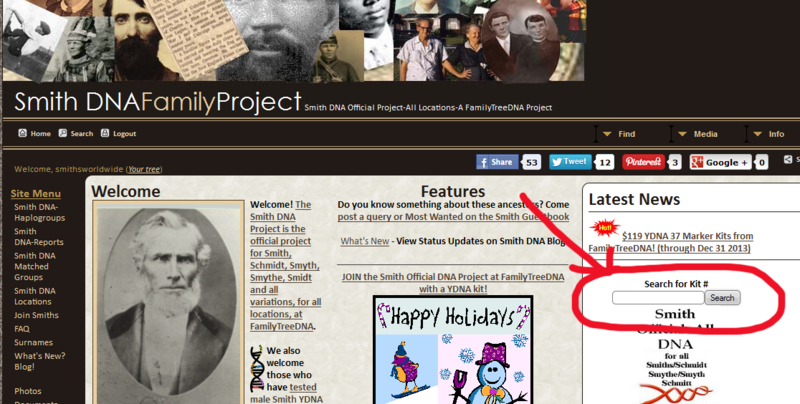 If you have supplied a photo of an early Smith ancestor, you will also see it on the page. All the icons are hyperlinked, meaning you just have to click them to get to that part of the site. IF YOU GET LOST, you can always go put in your kit number in the search forum and get back to that page. Although more tedious, you can also look at the DNA reports and find your kit, perhaps sorted by kit #, or lookup up by haplogroup (for a list of ALL the DNA reports, look in the black menu towards the top of the page for the DNA Reports item. Again, with so many people in the project, you might be going through quite a few pages before you come to your kit, so we suggest you always find your information much more easily with the Search for Kit # form located under the black menu at the top of most pages. IF YOU DO NOT HAVE A SMITH DNA KIT, and wish to look simply for Smiths/Schmidts/Smyths. etc, go to the TNG side of the site and search for your surname.